Enough already! 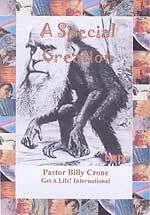 The debate over Darwinian Evolution (as it applies to the origin of the species) vs. Creationism has gone on far too long. Neither can be proved by scientific analysis and both are in fact solidly rooted in the realm of faith--religions, in other words. And all the heated rhetoric in the world will not resolve the conflict between the two. If someone refuses to believe that God literally spoke the universe into existence at some point less than ten thousand years ago, it is understandable because to accept that as fact requires faith. Conversely, to believe that we and the astounding complexities of matter surrounding us are the product of random chance, also requires faith. But when one side in this ongoing debate wages an intellectually dishonest campaign by insisting upon "facts" that are anything but factual, they should be exposed. Do you not agree? David Bay often speaks in his articles of controlled change taking place when some "respected authority" advocates a certain position calculated to bring about that change. Then when multitudes within academia adopt and vigorously defend that position, the pressure to conform is multiplied exponentially. As a result, all who would voice a dissenting opinion are subjected to ridicule by the experts. Censure by anyone perceived to be among the educated and intellectual elite has always been a powerful deterrent to those who see things differently. But the point often overlooked is that when a relatively uneducated man knows something, that bit of knowledge is not one whit less true than would be the case if he were an Oxford don. And God has quite a few interesting things to say about those who put an inordinate emphasis upon worldly knowledge and lack the wisdom to use it properly. "For God's [holy] wrath and indignation are revealed from heaven against all ungodliness and unrighteousness of men, who in their wickedness repress and hinder the truth and make it inoperative. For that which is known about God is evident to them and made plain in their inner consciousness, because God [Himself] has shown it to them. For ever since the creation of the world His invisible nature and attributes, that is, His eternal power and divinity, have been made intelligible and clearly discernible in and through the things that have been made (His handiworks). So [men] are without excuse [altogether without any defense or justification],  Because when they knew and recognized Him as God, they did not honor and glorify Him as God or give Him thanks. But instead they became futile and godless in their thinking [with vain imaginings, foolish reasoning, and stupid speculations] and their senseless minds were darkened. Claiming to be wise, they became fools [professing to be smart, they made simpletons of themselves]". Romans 1:18-29 (Parallel Bible, KJV/Amplified, emphasis mine). "O Timothy, guard and keep the deposit entrusted [to you]! Turn away from the irreverent babble and godless chatter, with the vain and empty and worldly phrases, and the subtleties and the contradictions in what is falsely called knowledge and spiritual illumination" 1 Tim. 6:20 (Parallel Bible, KJV/Amplified). "See to it that no one carries you off as spoil or makes you yourselves captive by his so-called philosophy and intellectualism and vain deceit (idle fancies and plain nonsense), following human tradition (men's ideas of the material rather than the spiritual world), just crude notions following the rudimentary and elemental teachings of the universe and disregarding [the teachings of] Christ (the Messiah). For in Him the whole fullness of Deity (the Godhead) continues to dwell in bodily form [giving complete expression of the divine nature]" Col. 2:8-9 (Parallel Bible/KJV/Amplified). But I digress. The point I wish to emphasize is that in this struggle "facts" are being presented to bolster the evolutionary position which some scientists who also hold that viewpoint have proven false. And textbooks in our schools are still teaching those blatant errors to our children. Dr. Hovind has a standing offer to pay $250,000 to anyone who can prove by scientific analysis that evolution--as it applies to the origin of the species--is a scientific fact. In other words, are examples of it observable, demonstrable, and repeatable? The offer has been on the table for several years now--so why have the champions of evolution not claimed the prize and silenced us ignorant "funnymentalists"? The gauntlet has been thrown and that camp ought to put up or shut up! 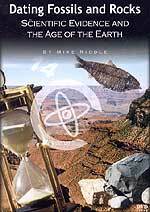 For any believer who feels intimidated by such "enlightened" bombast, I strongly urge you to contact Dr. Hovind about his lecture series on the subject. At my suggestion, our church recently purchased the entire set on DVD (seven discs, each containing appx.2 hrs.of material, for about $15 each)--which we have been watching as a part of our second service on Sundays. And we have been richly blessed by his humorous, but thoroughly factual and documented approach to the subject. Dr. Hovind seeks debate with any and all takers, but for some reason they are becoming harder to find! Wonder why? 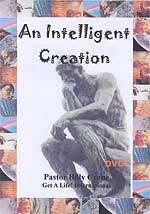 The information on the back of the DVD's indicates that he speaks over 700 times a year and "...has addressed thousands in debates with professors and scientists at many universities across America." My friends, if we remain silent about this issue the children of America (along with those in the rest of the world) will continue to be indoctrinated by a ridiculous theory masquerading as scientific fact. Creationism should not be forced upon anyone, but neither should totally unscientific supposition. And if you have any doubt whatever that evolution is unscientific nonsense when it speaks concerning the origin of all things, Dr. Hovind's presentation should change your mind. He argues his case in an easy to understand non-technical manner that is designed to appeal to common sense. For instance, if I were a "respected authority" and told you that it is possible for someone to flip a coin and have it land on its edge and remain balanced-- millions of times in a row--would you believe it? Would you believe it even remotely possible if an infinite amount of time were allowed? Common sense--native intelligence--knows intuitively that such is simply not possible because the mathematical odds against it happening are beyond astronomical. And such a coin flip pales by comparison to the countless complexities within nature. And those odds are probably why polls show that far more mathematicians than biologists reject the theory of evolution as being scientific. If you consider yourself to be very knowledgeable about this subject and take exception to my comments, please do not waste time berating me--contact Dr. Hovind and his panel of scientists. Show irrefutable evidence to them that evolution is a fact and make yourself a quarter of a million bucks! If you are successful the news media will make you famous. So come on, what are you waiting for?